It always puzzled me, that when Bruce Banner regained control of his 'Hulk' persona, he didn't hook back up with 'Earth's Mightiest Heroes'. Maybe between Wonder Man, the Vision, and Bruce's cousin; the sensational She-Hulk, the Avengers felt they had the strength base covered, but in that state the jade giant would've offered more than his share of smarts too. 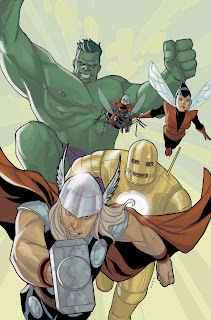 Flip forward to today, and Marvel is announcing a new five-part mini-series that jets back in time to the teams original line-up, to find out how non-team-players; Iron Man, Thor, Hulk, Wasp and Ant-Man, end up forming a crew that will become earth's first line of defense against all threats both foreign and domestic. It's title? Simply; Avengers: The Origin. In teasing the series at CBR, writer Joe Casey makes a pretty sweet point: "In hindsight, I think it's hilarious that, back in the early 60's, Marvel tried to sell the X-Men - five good-looking teenagers with fairly aesthetically-pleasing superpowers and fashionable, matching costumes - as the freaks. When it was really the Avengers - a guy in a scary metal suit, a Shakespeare-spouting "god" that could level a city, a gamma-irradiated brute with an anger problem and a pair of insect-sized heroes that hung around with ant swarms - who really looked freakish, who looked like characters you wouldn't wanna mess with. Those five teaming up is a pretty frightening thought." While it's great seeing the Hulk and Thor side by side, for me I'd still be sold even if it wasn't 'vintage Avengers'. Drawn by the incredible Phil Noto, any project that keeps this man at the drawing board is a good thing. Just look at that cover - wow.